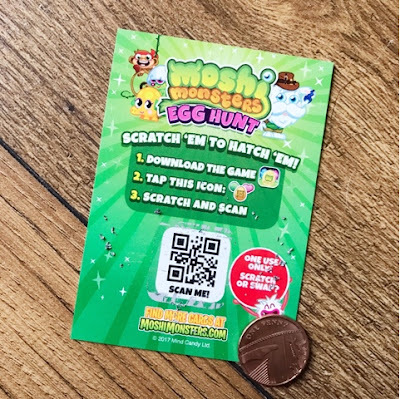 On 8th June 2017 Mind Candy announced the launch of the all new Moshi Monsters Egg Hunt mobile game and trading cards. 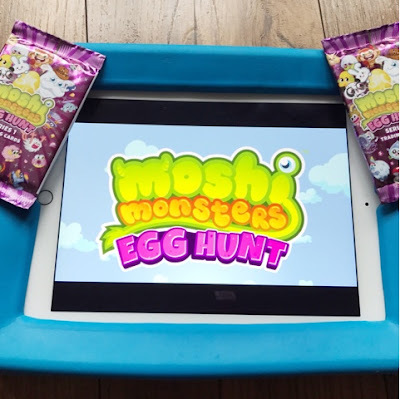 The mobile game can be downloaded from iTunes and Google Play which is great for kids who love Moshi Monsters and their gadgets. Like all small cute collectable toys having a game to go with it is the perfect addition and would you believe this rocketed the mobile game straight to number one in the App Store's 6-8 kids' chart as soon as it was released. With its simple but engaging game play and an ingenious secret code system, it’s an irresistible adventure for Moshi fans, both old and new. Logan and I were asked to review the new game and were sent a couple of packs of trading cards to try out as well. The game is very easy to find and download on the App Store and I loaded it onto Logan's iPad so he could have the game to hand whenever he wanted. Starting up the game the first thing you notice are the brilliantly vibrant colours and friendly music which instantly grab your attention. Logan didn't skip anything and wanted to watch the full intro to the game. It's good because one little Moshi Monster, Moshlingologist Buster Bumblechops, actually explains quite a lot in the first 5 minutes of play. So when you start up you get to adopt your very own unique pet Moshling. To do this you must hatch it from an egg, customise it then name the pet before it's yours. You can even collect your friends’ unique Moshlings because each personalised character has its own shareable code. Fab idea. You can find and hatch different Moshling pals every day to build you collection and there's no shortage going around. Within the first 15 minutes of play Logan already had found a couple of Moshlings. The currency in the game is Rox which look like rainbow diamonds. The good thing about these is that you can earn them easily by playing games, solving puzzles and answering questions. Rox can then be used to buy monstrous food, funny furniture and goopendous decorations in Snozzle Wobbleson’s Gross-ery Store. You can even zap your Moshlings’ poop to gain Rox! The adventure continues with complementary physical products such as the Moshi Monsters Egg Hunt Trading Cards which feature secret codes to unlock additional in-game goodies, characters and more. 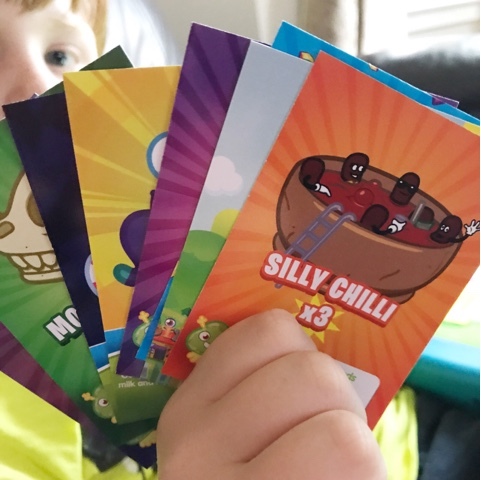 There are over 350 cards to collect, with each pack containing 8 cards, including Moshlings, items and an ultra rare card. Logan received two packs to try out and was very pleased with what he got. He received 2 Moshlings in each pack along with Rox, food, furniture and flooring for his Moshlings home. After opening each packet he couldn't wait to scan his items in. I think this was one of his favourite parts. It's so easy to do as well. Simply turn the card over, scratch the covered panel, open the scanning icon then scan away. It was great to watch and I'm pleased to report it all worked smoothly. In addition, Moshi Monsters is getting personal. The Moshi Monsters Egg Hunt Book, stars a totally unique, specially created Moshling, named after the reader, and is crammed with hidden codes to unlock characters in the mobile game. 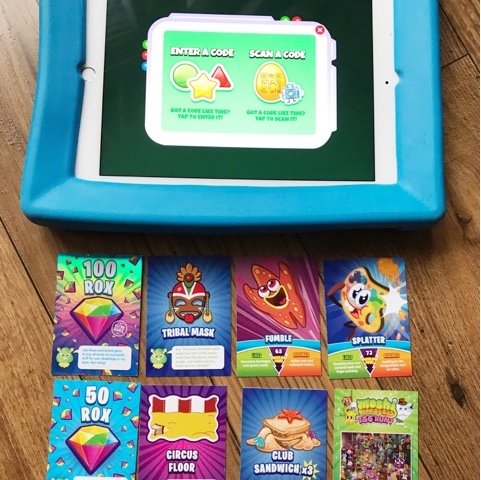 Each book also features a personalised poster and trading cards starring the reader’s unique Moshling. To celebrate the Moshi Monster’s Egg Hunt Mobile Game launch, Mind Candy are giving away an EGGS-clusive unique code to redeem a mystery Moshling. Just watch the video linked to find the code, download the FREE mobile game via the App Store and Google Play and see an iconic Moshling come to life! I was sent some Moshi Monsters Trading Cards in return for an honest review. 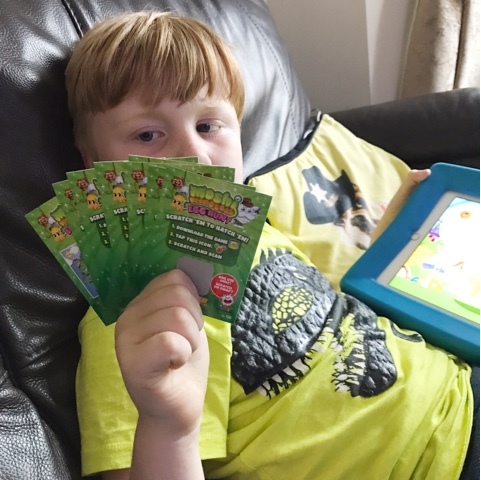 17 comments on "Egg-citing Fun with Moshi Monsters Egg Hunt Mobile Game & Trading Cards"
This is the kind of thing my 7 year old would love! Going to show her in the morning! Kids collectibles are just getting more and more sophisticated aren't they?! It's very addictive so I'm sure your daughter will get into it Jenna. She will Gee, my son can't put it down at times! It's great Alice, we're on our school summer holidays so perfect for a little down time. 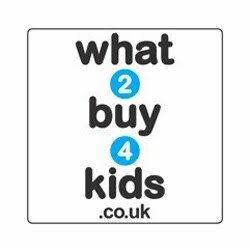 these look like so much fun, i will definitely show my eldest two these later! Keto Hack Seeing other individuals being lean and healthy and balanced helped me sad and anxious. I wanted to fit into them and encounter “normal” and satisfied. So, I decided to lessen my weight. There at night, I came across this Keto Hack Pills on the world wide web.